On a Saturday in March, the Seneca High School gym was full of cheering people. There were some who dressed up as soup cans. There were chants and dances going on as well. While most would have thought there was a basketball game going on, it was a different type of competition. Instead of athletic prowess and athletes being on the gym floor, mental acuity and future mechanical engineers were on display. Seneca was the site for the FIRST Mid-Atlantic Robotics Seneca District Competition. The competition had 37 teams from Pennsylvania, New Jersey and Delaware. Two of the teams were comprised of Lenape Regional High School District students. 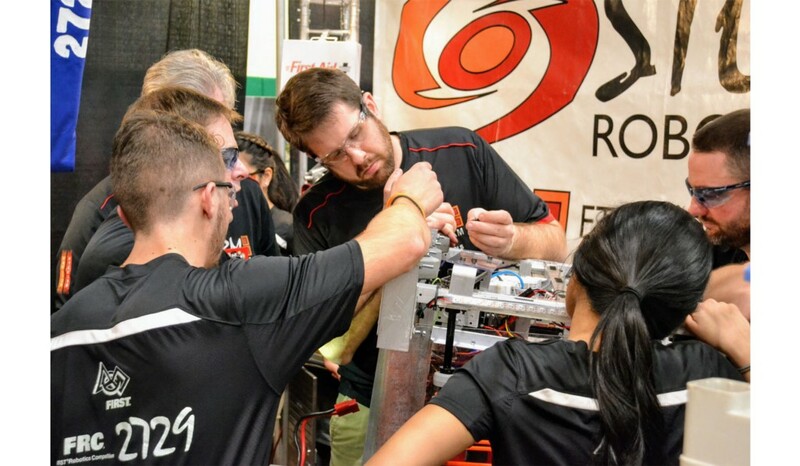 According to the FIRST Mid-Atlantic rules, teams are given parts and rules on what specifications are allowed and what the tasks of the event will include. The teams and their mentors take over from there. The two Lenape teams were the Iron Devils Robotics Team and the Storm Robotics Team. The Iron Devils were comprised of students from both Seneca and Shawnee high schools. The way the Iron Devils came up with their name was also unique. Allison Mosley, an 18-year-old Cherokee senior, was a part of the Storm Robotics Team, which was comprised of both Lenape and Cherokee high schools students. The Iron Devils and Storm Robotics faced each other in a match. The Iron Devils joined two teams to form the Red Alliance, and Storm Robotics teamed with two teams to form the Blue Alliance. The Blue Alliance won. While the robots are fun to watch and a lot of fun and excitement surrounded the event, it has a bigger lasting impact on those who participate. Click the box below to see more pictures from the competition.